The Honda CR-V range first hit the UK in 1997. It was promoted as an off-road vehicle with a 4-wheel drive, yet it also worked well as a spacious family vehicle. The car lasted until 2002, with 2 trim options that were manufactured in the UK. A popular iteration hit in 2010, adding a facelift and a new automatic gearbox option to the already excellent groundwork of the 2006 model. A 2.2-litre diesel engine was also on offer, which gave drivers a bit more power to help it out on the tarmac. The most recent addition in the UK is the 2012 model. It features an all-wheel-drive control system which really makes a difference to the feel of the car. If you have the cash to spare, you could always go with the 2015 facelift, which prioritises a sporty appearance. You’ll get a good deal of kit as standard in a first-gen used Honda CR-V, including air con, power steering and even a removable picnic table, which is a family favourite. Electric windows, mirrors and a sunroof are also included, while the SE Executive receives a CD player in place of the standard tape deck. With a second-gen used Honda CR-V, you’ll find they’ve enhanced the luggage room and provided more space for passengers. Flexible seating also improved its functionality, making it practical for those who want to chuck their skis, golf clubs or hiking gear in the back. The picnic tablet is also back in action. For the Honda CR-V's third iteration, Honda made big, bold alloy wheels a standard feature, while ditching the spare wheel. Further enhancements to the rear seating bench allow you to fit two full-size mountain bikes inside. The same applies to 2010 and 2012 used Honda CR-V, although more attention has been paid to the quality of the interior. 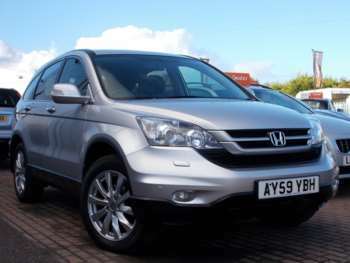 You're sure to find the right second-hand Honda CR-V for sale at RAC cars. The used Honda CR-V has become stiffer and more toned over the years, although all models are well suited to road driving. Due to their increased focus on a family-feel, the car is not as well equipped for off-road jaunts. However, a second-hand Honda CR-V is advanced, slick and stylish. What’s more, it drives like a dream!